If you think all infield dirt is the same, you haven’t talked to a shortstop. If you think, “sand is sand,” you haven’t talked to a volleyball player. Welcome to our world. We manufacture sports field maintenance materials based on scientific research, field managers’ directives, and players’ preferences. 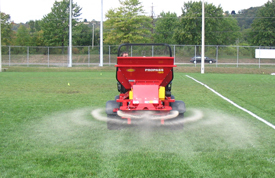 From the Major Leagues to little leagues, Waupaca Sand & Solutions’ products make sure athletic fields perform as well the as sports heroes who use them.